10 Things You Might Not Know About STAR TREK: GENERATIONS | Warped Factor - Words in the Key of Geek. 1. 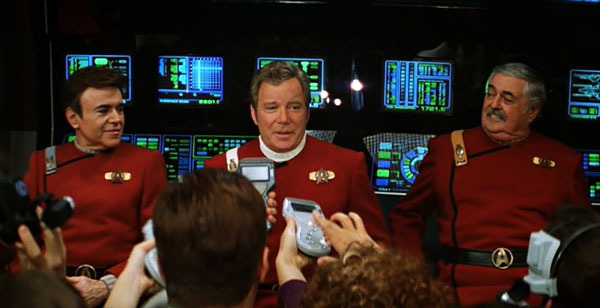 After production wrapped on Star Trek VI: The Undiscovered Country it was always expected that the seventh Star Trek movie would feature the cast of The Next Generation TV Show, and indeed, in late 1992 Paramount tasked The Next Generation producer Rick Berman with creating a feature film. Berman called Ronald D. Moore and Brannon Braga into a meeting. Both later stated that they figured that he was about to tell them the TV show had been cancelled, but instead they discovered that Paramount had approved a two-picture deal and Berman wanted them to write the first movie. The writers spent weeks with Berman developing the story before taking a working vacation in May 1993 to write the first-draft screenplay, which was completed June 1st 1993. 2. Berman felt that including the original cast of the previous Star Trek films felt like a "good way to pass the baton" to the next series. In the first draft of the screenplay, the original series cast only appeared in a prologue, and Guinan served as the bridge between the two generations. As initial feelers went out to the original cast, it was clear that most of them weren't happy with the idea. When George Takei was asked if he'd come back and play Sulu one more time, in a scene which would've seen him taking the helm of the Enterprise-B, he flat out refused. Takei felt if Sulu had taken the helm, it would have meant temporarily reducing the character's rank, so that he could serve under Captain Kirk again. Takei felt that Sulu had worked too hard to earn his command to allow even a temporary reduction. So a new character, Demora, daughter of Sulu, was created to speak Sulu's lines. 3. Knowing that the ideas weren't panning out the story was first reworked to give certain original characters more screen time, and eventually it was settled upon just focusing on the core trio of Kirk, Spock and McCoy, with the latter two appearing in cameo roles. However, Leonard Nimoy declined to appear. Nimoy, who was also initially offered the job of directing the film, felt that Spock's role was extraneous. "I said to everybody concerned [...] that if you took the dozen or so lines of Spock dialog and simply changed the name of the character, nobody would notice the difference." And he was kind of right, as Nimoy's lines were subsequently modified for James Doohan's Montgomery Scott. 4. DeForest Kelley wanted one more chance to play Dr. Leonard "Bones" McCoy, but due to his declining health, he could not get on-set insurance, which is a union requirement for anyone on a film set. Reluctantly he had to withdraw from the movie. His lines were then given to Walter Koenig as Chekov. "we wanted to aim high, do something different and big... We knew we had to have a strong Picard story arc, so what are the profound things in a man's life he has to face? Mortality tops the list." "we all sorta looked around and said, 'That might be it.' "
6. The production schedule was tight. There was to be a gap of only six months between The Next Generation ending its seven year TV run and the movie debuting in cinemas. So, with a knowing need for post-production scheduling, filming began on Generations while the cast of The Next Generation were still shooting the final episodes of the series. Any scenes which did not feature The Next Generation regulars were shot at this time. 7. As soon as production wrapped on the TV series, it was go go go, but unfortunately certain elements tasked to the design team were still not completed. Patrick Stewart and Brent Spiner were the only cast members to have their custom "colour-top" uniforms finished, so with Star Trek: Deep Space Nine on its Summer break, Jonathan Frakes had to borrow Avery Brooks' uniform and LeVar Burton used Colm Meaney's. 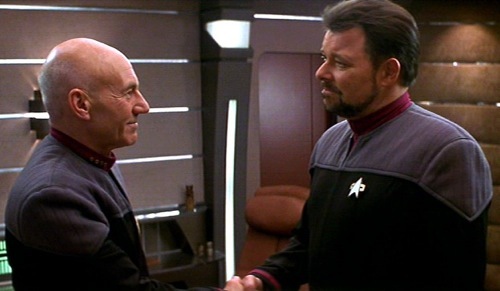 Neither of them fit the actors very well, Frakes had to roll up the sleeves and Burton's is obviously too big for him. 8. With his role as Captain John Harriman in this film, Alan Ruck becomes the tenth on-screen commander of the Starship Enterprise, joining Captains Jonathan Archer, Christopher Pike, Robert April, James T. Kirk, Will Decker, Spock, Rachel Garrett, Jean-Luc Picard and Edward Jellico. 9. William Shatner has stated that his line "Who am I to argue with the Captain of the Enterprise?" was the hardest line he ever had to deliver. 10. 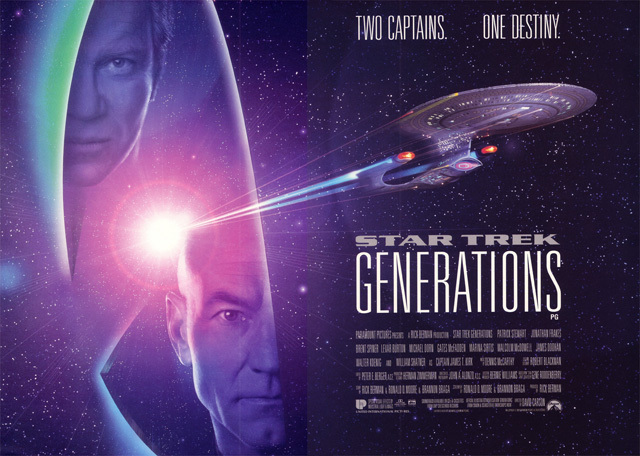 Upon release in November 1994, Star Trek: Generations became the very first movie to have a website specifically created to promote it. You can check out an archived reproduction of it here.